"Deontic" redirects here. For the linguistic term, see Linguistic modality. "Deontology" redirects here. It is not to be confused with the opposite of Ontology. In moral philosophy, deontological ethics or deontology (from Greek δέον, deon, "obligation, duty") is the normative ethical theory that the morality of an action should be based on whether that action itself is right or wrong under a series of rules, rather than based on the consequences of the action. It is sometimes described as duty-, obligation- or rule-based ethics, because rules "bind one to one's duty". Deontological ethics is commonly contrasted to consequentialism, virtue ethics, and pragmatic ethics. In this terminology, action is more important than the consequences. It is an ethical framework that depends on the predefined sets of rules and policies for the proper functioning of a system in the environment. The deontology is simply based on the checklist which includes certain rules to be followed while performing a particular task. According to this framework, the work is considered virtuous only if this checklist is completed. This procedure is very simple to implement and understand. Minimum time is consumed to decide between right and wrong. However, its simplicity ignores the consequences of the decision taken under this approach. The term deontological was first used to describe the current, specialised definition by C. D. Broad in his 1930 book, Five Types of Ethical Theory Older usage of the term goes back to Jeremy Bentham, who coined it before 1816 as a synonym of Dicastic or Censorial Ethics (i.e. ethics based on judgement). The more general sense of the word is retained in French, especially in the term code de déontologie (ethical code), in the context of professional ethics. There are numerous formulations of deontological ethics. Contemporary deontologists (scholars born in the first half of the 20th century) include Józef Maria Bocheński, Thomas Nagel, Thomas Scanlon, and Roger Scruton. Bocheński (1965) makes a distinction between deontic and epistemic authority. A typical example of epistemic authority in Bocheński's usage would be "the relation of a teacher to his students"; an example of deontic authority would be "the relation between an employer and his employee". A teacher has epistemic authority when making declarative sentences that the student presumes is reliable knowledge and appropriate but feels no obligation to accept or obey; in contrast, an employer has deontic authority in the act of issuing an order that the employee is obliged to accept and obey regardless of its reliability or appropriateness. Frances Kamm's "Principle of Permissible Harm" (1996) is an effort to derive a deontological constraint which coheres with our considered case judgments while also relying heavily on Kant's categorical imperative. The Principle states that one may harm in order to save more if and only if the harm is an effect or an aspect of the greater good itself. This principle is meant to address what Kamm feels are most people's considered case judgments, many of which involve deontological intuitions. For instance, Kamm argues that we believe it would be impermissible to kill one person to harvest his organs in order to save the lives of five others. Yet, we think it is morally permissible to divert a runaway trolley that would otherwise kill five innocent and immobile people onto a side track where one innocent and immobile person will be killed. Kamm believes the Principle of Permissible Harm explains the moral difference between these and other cases, and more importantly expresses a constraint telling us exactly when we may not act to bring about good ends—such as in the organ harvesting case. In 2007, Kamm published a book that presents new theory that incorporates aspects of her "Principle of Permissible Harm", the "Doctrine of Productive Purity". Like the "Principle of Permissible Harm", the "Doctrine of Productive Purity" is an attempt to provide a deontological prescription for determining the circumstances in which people are permitted to act in a way that harms others. Attempts have been made to reconcile deontology with virtue-based ethics and consequentialism. Iain King's 2008 book How to Make Good Decisions and Be Right All the Time uses quasi-realism and a modified form of utilitarianism to develop deontological principles which are compatible with ethics based on virtues and consequences. King develops a hierarchy of principles to link his meta-ethics, which are more inclined towards consequentialism, with the deontological conclusions he presents in his book. ^ from the verb δέω "bind, tie, fetter", via the present participle stem deont- + the suffix -logia. ^ "Deontology dictionary definition | deontology defined". ^ Waller, Bruce N. 2005. Consider Ethics: Theory, Readings, and Contemporary Issues. New York: Pearson Longman: 23. ^ Flew, Antony. 1979. "Consequentialism". In A Dictionary of Philosophy (2nd Ed.). New York: St Martins: 73. ^ Beauchamp, Tom L. 1991 Philosophical Ethics: An Introduction to Moral Philosophy, 2nd Ed. New York: McGraw Hill: 171. ^ Jeremy Bentham, Chrestomathia (1816), p. 213: "For a synonym, Dicastic Ethics may have the single-worded appellative Deontology. [Deontology.] From two Greek words, the first of which signifies fit, fitting, right, becoming, proper. Deontology—an account or indication of that which, on the occasion in question, whatsoever it be, is—(i.e. by him who speaks or writes, is regarded as being)—fit, fitting, becoming, proper. It is in sound only, and not in signification, that it has any connexion with the word ontology, employed above. Applied to every branch of Ethics, taken in the largest sense of the word Ethics, the use of such a word as Deontology affords a promise of being attended with considerable convenience. It will accord equally well with every system which ever has been, or ever can be, devised, in relation to the foundation of moral obligation :—in the use of it, no such incongruity and presumption is involved, as that which is called petitio principii—i.e. a begging of the question—an assumption of the matter in dispute." Also explained as "the knowledge of what is right and proper": "Deontology is derived from the Greek words, το δεον (that which is proper) and Λογια, knowledge — meaning the knowledge of what is right and proper; and it is here specially applied to the subject of morals, or that part of the field of action which is not the object of public legislation. As an art, it is the doing what is fit to be done; as a science, the knowing what is fit to be done on every occasion." Deontology or, The science of morality : in which the harmony and co-incidence of duty and self-interest, virtue and felicity, prudence and benevolence, are explained and exemplified : from the MSS. of Jeremy Bentham ed. Bowring (1834), p. 21. ^ a b c Kant, Immanuel. 1785. "First Section: Transition from the Common Rational Knowledge of Morals to the Philosophical", Groundwork of the Metaphysic of Morals. 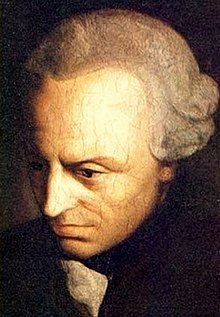 ^ Kant, Immanuel (1785). Thomas Kingsmill Abbott (ed.). Fundamental Principles of the Metaphysic of Morals (10 ed.). Project Gutenberg. p. 23. ^ Scruton, Roger (2017). On Human Nature (1st ed.). Princeton. pp. 79–112. ISBN 978-0-691-18303-9. ^ Kamm, F. M. 1996. Morality, Mortality Vol. II: Rights, Duties, and Status. New York: Oxford University Press. ^ Kamm, F. M. 2007. 'Chapter 5: Toward the Essence of Nonconsequentialist Constraints on Harming.'. In Intricate Ethics: Rights, Responsibilities, and Permissible Harm. Oxford: Oxford University Press. ISBN 978-0-19-518969-8. ^ King, Iain (2008). How to Make Good Decisions and Be Right All the Time. Continuum. p. 245. ISBN 978-1-84706-347-2. Page 220 of this book lists fourteen deontological principles, which it describes as "The first fourteen principles of right and wrong". Beauchamp, Tom L. 1991. Philosophical Ethics: An Introduction to Moral Philosophy, 2nd Ed. New York: McGraw Hill. Broad, C. D. 1930. Five Types of Ethical Theory. New York: Harcourt, Brace and Co.
Flew, Antony. 1979. 'Consequentialism'. In A Dictionary of Philosophy (2nd Ed.). New York: St Martins. Kamm, F. M. 1996. Morality, Mortality Vol. II: Rights, Duties, and Status. New York: Oxford University Press. F. M. Kamm Professor of Philosophy Harvard University (2006). Intricate Ethics Rights, Responsibilities, and Permissible Harm Rights, Responsibilities, and Permissible Harm. Oxford University Press. ISBN 978-0-19-534590-2. Kant, Immanuel (1964). Groundwork of the Metaphysic of Morals. Harper and Row Publishers, Inc. ISBN 978-0-06-131159-8. Olson, Robert G. 1967. 'Deontological Ethics'. Paul Edwards (ed.) The Encyclopedia of Philosophy. London: Collier Macmillan. W. D. Ross 1930. The Right and the Good. Oxford: Clarendon Press. Salzman, Todd A. 1995. Deontology and Teleology: An Investigation of the Normative Debate in Roman Catholic Moral Theology. University Press. Waller, Bruce N. 2005. Consider Ethics: Theory, Readings, and Contemporary Issues. New York: Pearson Longman. Wierenga, Edward. 1983. 'A Defensible Divine Command Theory'. Noûs, 17 (3): 387–407. Dumaguete city. Wikimedia Commons has media related to Deontological ethics. Freedom and the Boundary of Morals, Lecture 22 from Stephen Palmquist's book, The Tree of Philosophy (fourth edition, 2000).